Following this prologue, Mario and Peach set out in battling the viruses using the drug that Mario has invented. The two use the drug to decimate the rapidly growing viral populations before they can escape the containment bottles. In a strange set of scenes which play out after enough levels are beaten. 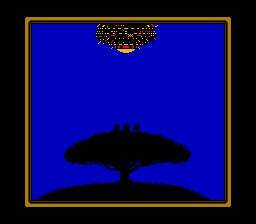 In the NES version, we see three viruses sitting on top of a tree in a grassy field. What appears to be a baby triceratops hatching from an egg flies by. Day shifts to night and an alien space craft flies down and uses a tractor beam to abduct the viruses. In the Gameboy version, three viruses instead sit on the bottom of the ocean and watch various sea life go by. Once again a UFO attempts to abduct the viruses but this time a large fish swims by and eats the viruses first. So, there is a lot going on here and it’s all pretty strange. I have to believe that Mario and Peach going into medical research is directly tied to the appearance of the game’s strange viruses. In my interpretation, these viruses mysteriously appear across the Mushroom Kingdom and begin harming its citizens. The two decide to set up a research lab to study these strange creatures and try to help the kingdom. I am basing this on the fact that, even though we see the pair successfully contain the viruses in the lab, the viruses appear to have spread across the land and sea of the kingdom. Mario acting as a doctor is not entirely unusual given that we have seen his propensity for working many strange jobs before and his willingness to do anything to save those in need. Peach acting as a nurse, on the other hand, is somewhat surprising given that she already has a very important role as the kingdom’s matriarch. The Princess may genuinely just recognize the danger of this situation and be willing to help in any way she can. Alternatively, she could be using this moment as a PR boost with her citizens. Unfortunately, the games to this point haven’t really given us enough of a read on her personality to make this call. In terms of the ending scenes, the flying triceratops is strange but not that much more unusual than most things in this series. Dinosaurs are common in this world and they often have magical abilities, so I think we can just leave it at that. As for the alien space craft, this is now the second time we’ve seen such vehicles, the first being Super Mario Land. It seems plausible that these aliens may be related to Tatanga in some way, if not the same species. How they relate to the viruses and why they abduct them is less clear. Did the viruses arise from Tatanga’s invasion? Or are they being taken for use in the future as a weapon? Hopefully future games can help answer these questions. We learn in this title that the Mushroom Kingdom has a hospital with a virus research lab, which is far more technologically advanced than what we typically see in the more medieval-themed kingdom. In the next article I will tackle one of Mario’s all time greatest adventures in Super Mario World!